Your archives needs a mascot! I met Harold my first day on the job. As sometimes happens in an archives, Harold was left anonymously by someone who didn’t want to care for him anymore. All he had was his hat. Poor sad Harold. I gave Harold a t-shirt and bow tie (and my name tag), and KABLAM! 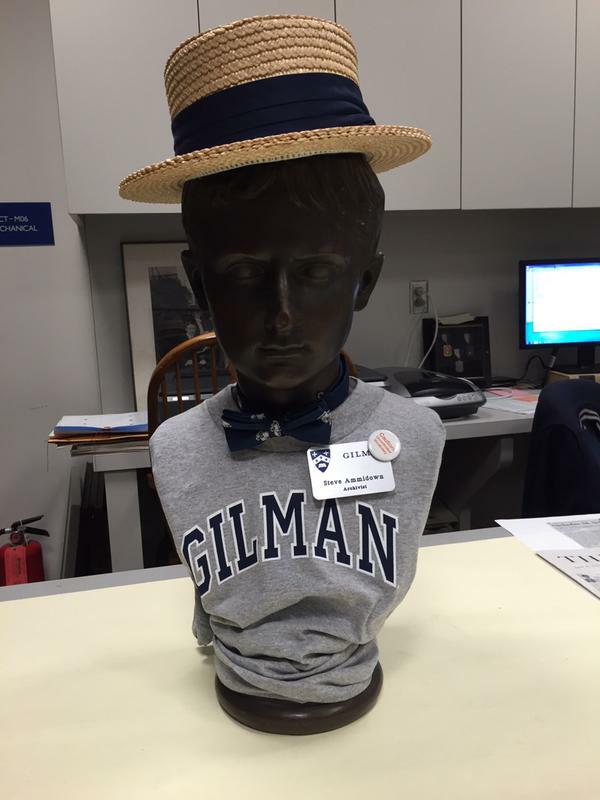 he took on a new life as the Gilman Archives mascot. The kids love him- after a visit by the third grade class, several of the kids took it on themselves to make sure that they said goodbye to Harold on their way out in the evening. And that last bit? That’s why your archives needs a mascot. Maybe not Wally the Green Monster or anything, but a mascot of some sort. A few weeks ago, I gave a talk on outreach ideas for archives, and I kept coming back to this idea of archives becoming “beloved”. This isn’t a term often associated with our profession. We are serious primary resource providers, and our public presence often reflects that. Beyond our projections, public perception of archives does not exactly skew towards “love”. Thing is, I truly believe this puts us at a huge disadvantage in resource battles. So what can we do? Build on mutually beneficial relationships, of course. But also, we need to show our lighter side. Make public our bad puns, write silly blog posts, and yes, show off our mascots. Mascots are an immediately recognizable, visual touchpoint for our stakeholders, something we often lack. I mean, who would forget Archive the Archival Box? Or Gravitas the Lobster? It shows we’re human, it breaks down some of the barriers between archivist and user, and most importantly it’s just plain fun. So. Does your archives have a mascot? Tell me more! If not, why not?